Welcome to History Undressed, guest blogger, Ally Broadfield! She's here today to spread some Christmas cheer and talk to us a bit about Christmas traditions in Russia. Enjoy! Christmas in Imperial Russia was celebrated with a blend of traditions from Russia’s Christian and pre-Christian past. On Christmas Eve it was customary for groups of people masquerading as manger animals to travel from house to house performing and singing carols known as kolyadki. Somekolyadki were pastoral carols to the baby Jesus, while others were homages to the ancient solar goddess Kolyada, who brought the lengthening days of sunlight through the winter. In return for their songs, the singers were offered food and coins before moving on to the next home. There is a passage in Leo Tolstoy’s War and Peace describing this custom, known as mumming. Everyone participated in the mumming. In the 17th century, the tsar himself, followed by his boyars and courtiers and led by drummers, would travel by sleigh from house to house in Moscow to sing for the owners. Peter the Great was also known to congratulate his friends in this manner, but he kept a list of participants and those who did not join were punished. 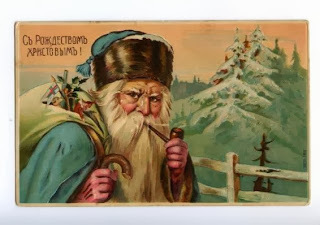 Religious observances surrounding Christmas also flourished in Imperial Russia. Though the foods and customs surrounding the observance of Christmas differed from village to village and family to family, certain aspects remained the same. Christmas Eve was the last day of the six week Christmas fast, and for the devout, ancient custom dictated that no one eat until the first star shone in the sky. Hay was spread on the table and covered with a white cloth in imitation of the manger. Dinner began with a prayer for the New Year and a special porridge called kutya. The head of the household would throw a spoonful outside to encourage Grandfather Frost to spare the crops, then a spoonful was thrown up on the ceiling. The grains that stuck foretold the number of bees there would be in summer to ensure a plentiful honey harvest. Lastly, upon rising from the table, everyone left some kutya in their bowls for their departed relatives. After the meal it was time to attend the Christmas Mass. On Christmas day, it was customary for everyone to dress in their finest clothes and go visiting. Tables were spread in a traditional manner with a variety of nuts and fruits, as well as several types of special gingerbread cookies. 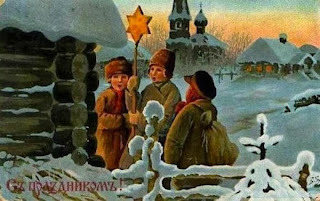 The two-week feast known as Russian Christmastide, or Svyatki, was celebrated after the orthodox Christmas on January 7th through Epiphany on January 19th. Activities during this period were more closely associated with pagan traditions and included singing, dancing, carnivals and fortune telling. After the 1917 Revolution, Christmas was banned throughout Russia along with other religious celebrations. It wasn’t until 75 years later, in 1992, that the holiday was once again openly observed. Bibliography: Massie, Suzanne. The Land of the Firebird: The Beauty of Old Russia. New York: Simon & Schuster, Inc., 1980. Ally Broadfield lives in Texas and is convinced her house is shrinking, possibly because she shares it with three kids, five dogs, two cats, a rabbit, and several reptiles. Oh, and her husband. She likes to curse in Russian and spends most of her spare time letting dogs in and out of the house and shuttling kids around. She writes historical romance and middle grade/young adult fantasy. Her first book, Just a Kiss, is coming from Entangled Publishing in January 2014. Wonderful post, Ally! Isn't it amazing how far back some of our traditions go? Thanks for sharing! Tweeted as well! Thanks for stopping by, Lana! I do love to learn about historical Christmas traditions. A child of five would have to wait until she or he was eighty to once again celebrate Christmas. Very informative post, Ally! Ally, thanks for the great post. I love learning about more Christmas Traditions. I loved this post, Ally! I've been having fun doing historical research of Katherine the Great, so this was great fun to read! Thanks! Thanks for coming by, Angelyn! It would certainly be hard to wait that long, though I think they celebrated secretly. Thanks, Suzi! I'm glad you enjoyed the post. So glad you liked the post, Lani! Have you read The Winter Palace: A Novel of Catherine the Great? It's historical fiction, but still excellent. Robert K. Massie's biographies of the the Romanovs are also excellent. I loved this post, Ally. Thank you and Merry Christmas! Tweeted. Thanks, Ella- for stopping by and for the tweet! Merry Christmas! I love Christmas history and hearing how other countries celebrate. In every country including England and by extension the US I see a bit to of the pegan believes adopted and wrapped into the Christian celebrations. It's how Christianity pulled in those wanted to continue their own tried and true beliefs and traditions. But it worked. Thanks so much for this lovely blog. Great topic, Ally! It's fun learning how other cultures celebrated Christmas. The Russian postcards are beautiful! I'm glad you enjoyed the post, Sharla. I agree with your analysis about how the church drew people in. During a history class in college, we studied how several Christian holidays were set to coincide with pagan celebrations. Thanks for coming by, Lyn. I'm glad you liked the postcards, but I can't take credit for them since they're in the public domain. They are lovely. Ally, very informative post. Porridge on the ceiling? Some mess to clean! LOL, Carol. I was thinking the same thing.